The Inverse Dynamics block returns the joint torques required for the robot to maintain the specified robot state. To get the required joint torques, specify the robot configuration (joint positions), joint velocities, joint accelerations, and external forces. Joint velocities, specified as a vector. The number of joint velocities is equal to the degrees of freedom (number of nonfixed joints) of the robot. Joint accelerations, specified as a vector. The number of joint accelerations is equal to the degrees of freedom of the robot. Joint torques, returned as a vector. Each element corresponds to a torque applied to a specific joint. The number of joint torques is equal to the degrees of freedom (number of nonfixed joints) of the robot. Use the manipulator algorithm blocks to compute and compare dynamics due to gravity for a manipulator robot. Calculate the velocity-induced torques for a robot manipulator by using a robotics.RigidBodyTree model. 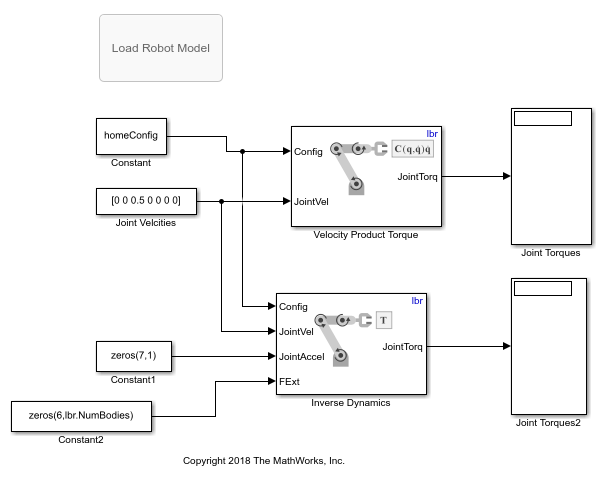 In this example, you define a robot model and robot configuration in MATLAB® and pass them to Simulink® to be used with the manipulator algorithm blocks.